Ariake Nishi Gakuen in Koto-ku, Tokyo, which opened in April, won two best prizes at the Excellent Wood-Using Facility Contest and the Wood Design Award for fiscal 2018. 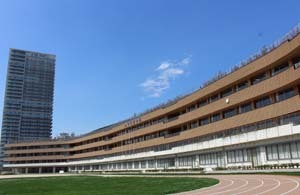 The school is gaining attention for its 5-story large-scale wooden building as a pioneering construction in Tokyo where the 2020 Olympics are scheduled. For more information, please refer to The Rinsei News, Issue No.594, published on December 5.